Guest Designer Beth Wheeler Shares Tip and Technique! Beth Wheeler is a very active and creative designer! She is a member of the facebook group "eBrush by Craftwell". She loves to share her work and her techniques. We are delighted to have her on the CraftwellUSA Blog today! Thank you Beth! Hi everyone Beth here today with a blog post sharing a gate card I created using the eBosser and eBrush. As well as a sneak peek of a project where I used a blender marker in my eBrush for the background. The eBosser and eBrush are my two go to tools and they sure save a lot of money. 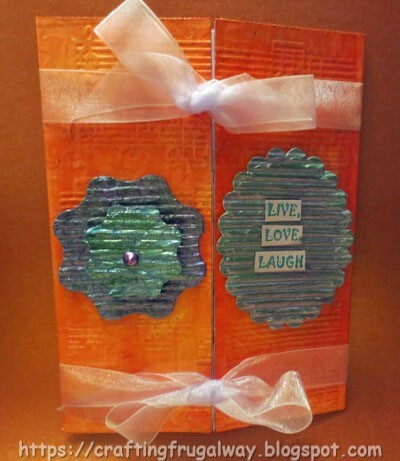 Especially when you can take things like corrugated cardboard and turn into embellishments. 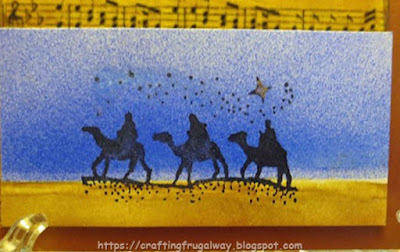 I started out by sprinkling Brusho Colour Crystals on the raised side of the embossing folder. I then sprayed my card stock with water and embossed like usual with the eBosser. Once the cardstock dried I brushed an Iridescent medium which because the crystals are water soluble blended the colors more. The fun of using powder pigments this way is you never know how it is going to turn out. Results will vary on the paper you use and how wet the paper is. Just remember some papers and cardstock have a tendency to curl. I often will leave my embossed piece in the folder and let it dry overnight. With a book on top of the folder. Next step was to take thin corrugated cardboard and dies and cutting it with the eBosser. I love how nicely and easily the eBosser cuts out the cardboard. You can’t really tell in the photo but the flower petals were also run through with an embossing folder. Then I took two different alcohol markers and using the eBrush colored my cut outs. It was fun seeing the different looks using the same two markers depending on which color I started with. Especially when I used a blender marker in the eBrush after applying the colors. I could have left the pieces at this stage like they were but I wanted more of a metal look so brushed iridescent medium on. For the flower I used Liquid Pearl for the center. The final touch was to stamp the sentiment and cut it apart. Then attach ribbon to keep the card closed. If you have not used an alcohol blending marker in the ebrush you will want to try it. You can lighten colors. Mix two colors together. Get almost a watercolor look. Here is a piece I recently did using the blending marker on the sand after brushing two colors. I also used the blender marker in the darker part of the sky as I was afraid it was too dark for the stars to show when I stamped. The music background was not eBrushed but the color matches the sand. That is why I love my eBrush. Matching colors is so easy. Don't be afraid to experiment with both your embossing machine and eBrush. Thank you for stopping by and I hope you will try pigment powders in an embossing folder. As well as a alcohol blender marker in your eBrush. Also don't forget to try using things like corrugated cardboard. Have fun! Very cool card! I love the techniques you used! I do have an eBosser but the eBrush is definitely on my wish list! You are so talented...very cool card..I would love to learn to do your techniques. Beth, your work is fantastic!